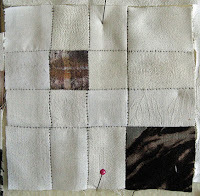 I have just two nine-patch blocks to stitch up, and then I'll be ready to begin assembling this piece, as yet unnamed. I've used mostly-hand dyed, discharged, shiboried fabrics as complements to the white. 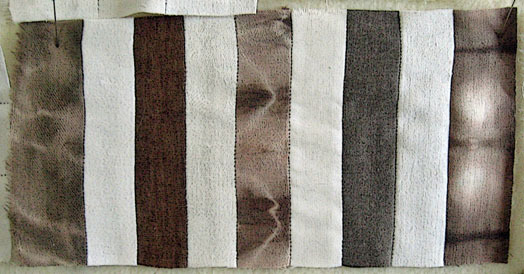 These two horizontal panels take the place of two nine-patch blocks each, as alternative ways to fill the same amount of space. These are three ways I've made tiny, one-inch nine-patch blocks into 4-1/2 inch blocks. 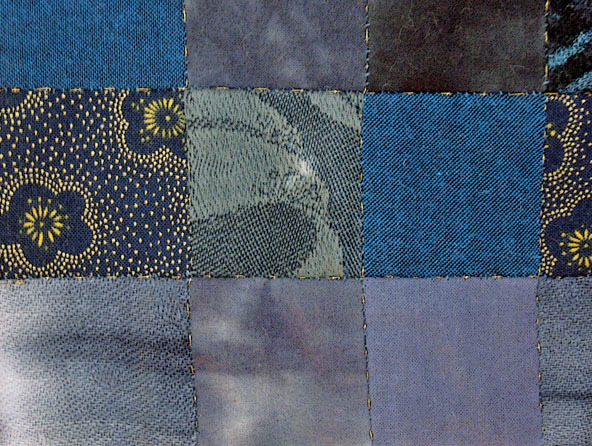 Following assembly, I'll quilt the piece to a backing fabric ~ still undecided at this point whether there'll be an inner layer. Then I've got some applique in mind. I've really enjoyed working on this so far. I've got an idea or two in mind for what's next. But there's still a lot to do on this piece before then. Perhaps I'll call this, "I know what I did this summer." Probably I won't. Thanks for your wonderful, heartfelt comments on my last post. I really do feel your love, truly for the first time. I no longer have that faux-belief about my unlovability in the way. I've made a few nine-patches on my new white piece this week. I'm using a bit of color as well. Planning something that could be as big as 27 x 27 inches, more of a cloth than a quilt although I'll likely quilt the top to a single-thickness backing fabric. I actually don't know yet. Just taking it one step at a time. I also haven't yet decided whether I'll gather 36 nine-patches and then piece them together, or perhaps put a few together at the outset and build outward from there. I'm just making patches at this point. I continue to battle that allergy sinusitis I wrote about months back. I suspect it became a sinus infection some weeks ago although I haven't had much in the way of typical infection symptoms. I did get antibiotics for it earlier this week. No significant change yet. I'm taking amoxicillin but may have to go to something stronger if this doesn't knock out the infection. It's been maybe 30 years since I've taken antibiotics for anything. I'm also taking probiotics. The Hare With Amber Eyes by Edmund deWaal. Best book I've read in eons. H is for Hawk by Helen Macdonald. Reading this now. Tracks by Robyn Davidson. Also saw the movie. I spent the last few days working away on this piece. And then decided last night that as much as I do like it, what I'm after right now is something that's more white than this is with its off-white fabrics. 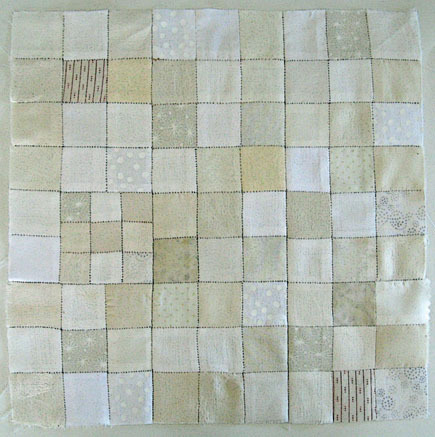 So this morning I stitched the nine blocks together and stuck this on my design wall for use later on in something else. 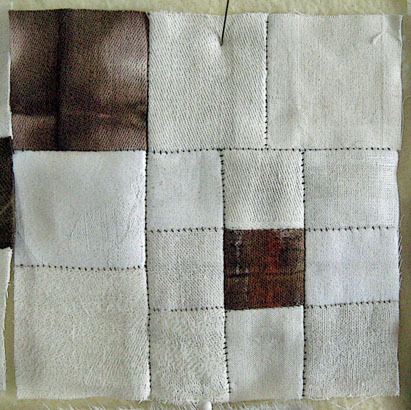 Or I might take it apart and use the 9-patch blocks in other pieces. The color white...there are as many whites as there are versions of every other hue. What I don't want right now are colors like ivory, buff, vanilla, French vanilla, old lace, eggshell, cream, etc. I'm looking for something that I would consider real white, something perhaps like coconut white. I went through all my "white" fabrics again last night, many of which I just purchased recently, and separated them into stacks by how white they are. 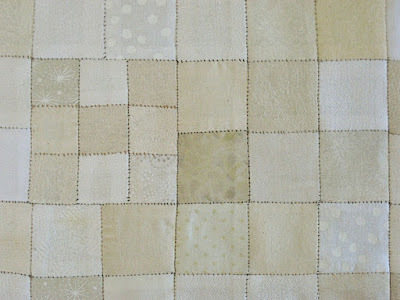 It's amazing how all those vintage linens I have are so many different shades of white. No two are exactly the same. Fortunately there are some really white ones in my stash, and so I'll start my project over again. Meanwhile, I enjoyed working on this so it wasn't a loss by any means. Hard to photograph well, but here are a couple images of those gold threads. As you see in the bottom photo, I left 1-1/2 to 2 inches of thread loose after knotting at each end of every row and column. 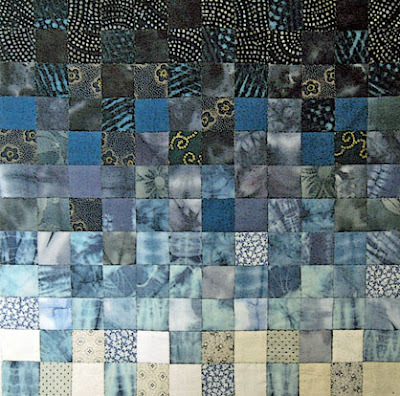 This is Nightfall, about 19 inches square. 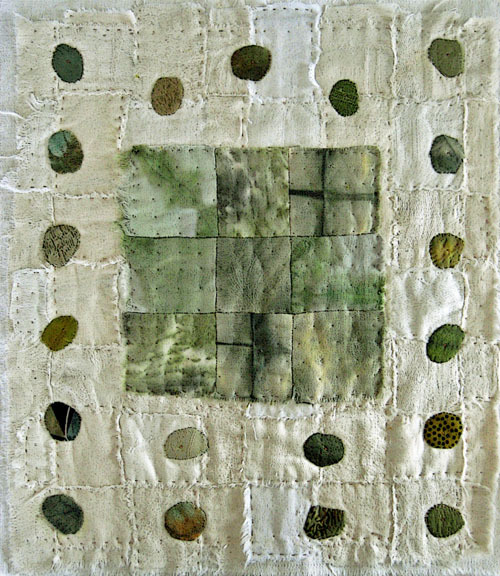 I quilted this piece with metallic sewing thread as I did the previous one, this time gold. When you see the quilt in the flesh, tiny flecks of gold catch your eye. I decided not to do any embellishment on this after considering a couple of possibilities. Once you start, where do you stop? Hence, nothing added. 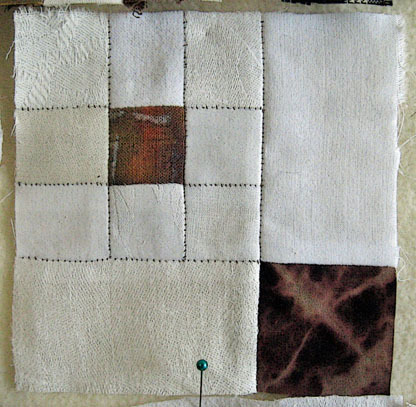 I'm so enjoying working with little squares, that now I'm creating an indeterminate piece, using white and ivory squares. 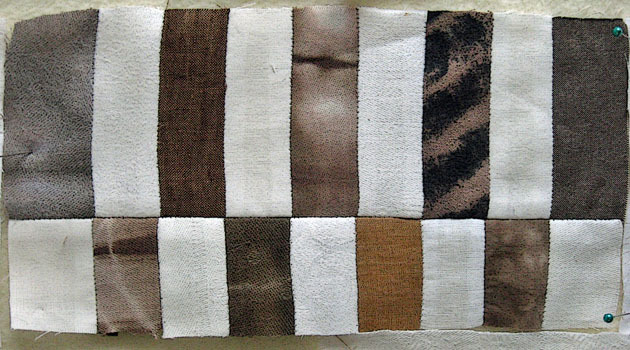 I'm making small nine-patches that I'll eventually stitch together. 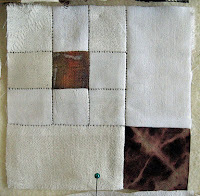 Working with 1-1/2 inch squares (my preferred size and the size in Nightfall), as well as smaller and larger squares. 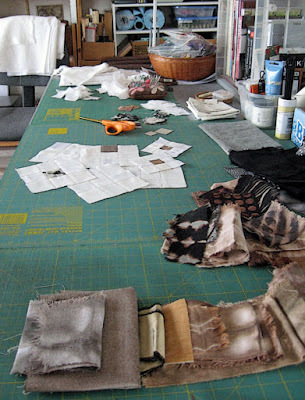 You can work all sizes together into one piece, which is what I intend to do. I recently bought a number of quarters (fat and long) of a bunch of different fabrics, to flesh out my stash. 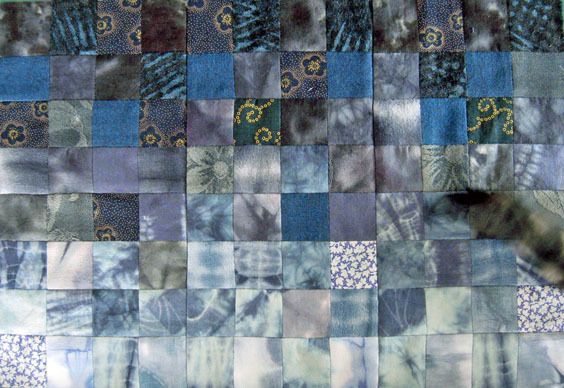 I like using handmade and commercial fabrics together. 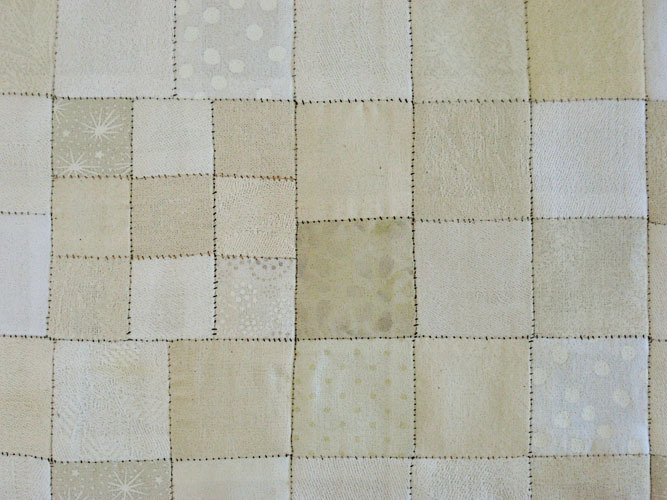 A lot of the white/ivory cloth I'm using now is vintage table linens that I've had since my eco dyeing days, as well as undyed silk jacquard fabrics, plus other undyed cottons and linens. This is what I've completed thus far on my homage to the sky. That dark blur on the right side is BeeGee's tail on the wag. Size at this point is 18 x 12 inches. I feel discombobulated -- so much craziness happening in the world, everywhere. I don't know how to hold it, how to embrace it all as just what's so. It feels as though the air is filled with tension. I've put my handwoven fabrics On Sale at Etsy -- 15 percent off through July 20. This is Field of Green, 14 x 16 inches. The difference between the finished piece here and the one I showed you several weeks ago is that this has been quilted, with Gutermann metallic copper sewing thread. If you read my early post yesterday, which no longer exists, just forget we had that conversation. I always loved this piece just as it was/is. Some voice in my head, though, said it wasn't done enough just as it is. So I spent several days during the past week mucking it up with appliqued tree branches (which I saved and will use elsewhere) and way too much embroidery. During the day yesterday, after posting the now-deleted image, I felt so uncomfortable about what I'd done with this piece that I deleted the post. 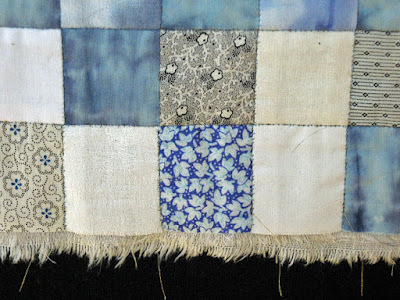 I spent last night removing all the embroidery and the applique, and treating the quilt with a solution to remove the pencil and chalk markings (which are 95% gone). 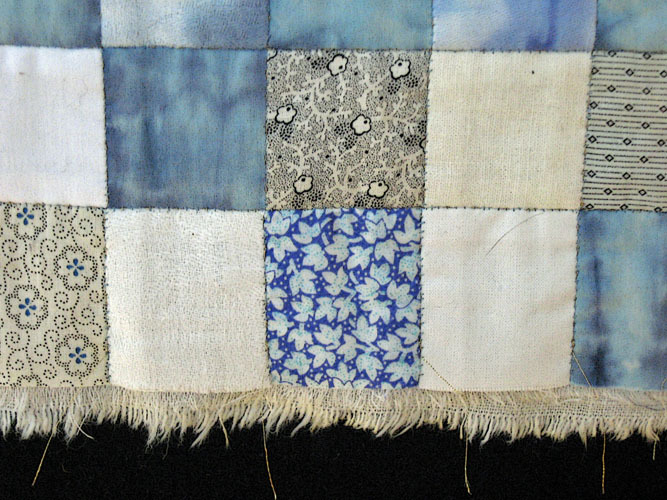 And this morning I added bits of quilting in places that were previously covered by applique. That was just another one of life's many lessons in trusting my intuition. If something is simple and beautiful and I like it just the way it is, that's good enough. What I love most about this hand stitching work is building the base with little squares, and applique when I use it. I don't want to do a tremendous amount of embroidery on every piece -- Energy Rising (now called Kundalini Rising), was an exception. I've already cut out squares for my next piece, a paean or ode to the darkening sky. Now I can start in on it with a clear conscience, now that I cleaned up Field of Green. If you're in the States, I hope you have a safe and fun holiday weekend; and just a plain-old great weekend to the rest of you.